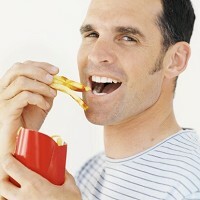 Men's risk of prostate cancer is increased by a third if they eat more than one serving of fried foods a week. Junk food favourites like battered fish, chips, doughnuts and fried chicken may be protagonists in the forming of destructive and potentially fatal types of the illness, new research indicates. The risk of prostate cancer seems to increase 30-37% in men who eat deep fried foods at least once a week, in comparison to men who say they only eat deep fried foods less than one time each month, according to research results published in The Prostate journal. Illness need not keep people home as there is now travel insurance for cancer patients. The study conducted at the Fred Hutchinson Cancer Research Centre in Seattle, US, involved delving into data from two studies that looked at a total of 1,549 men with a prostate cancer diagnosis, and a separate study involving 1,492 healthy men who were of a similar age and profile to the men with cancer.